1.It is my privilege to be here with you today for the inauguration of this International Seminar on "Clean and Capable India of Gandhi’s Dream”. At the outset, let me compliment the Rajghat Samadhi Committee for organizing this symposium on a topic of great relevance. I also thank the Committee for giving me the opportunity to share my views before this august audience. 2.It is only apt that this seminar is being held on a day, which 85 years back, marked a defining moment in our freedom struggle – the start of theDandi March by Mahatma Gandhi for Salt Satyagraha. The breaking of the unjust salt law by Gandhiji through the symbolic act of salt-making triggered the larger Civil Disobedience Movement across the country. It not only shook the foundations of the British Empire towards India’s independence, but also helped garner world-wide attention about our nation’s plight. 3.Gandhiji was a revolutionary of an extraordinary nature, with a rare farsightedness clearly demonstrated, a century ago. Throughout his life, Gandhiji learnt from each and every experience. He had the insight and ingenuity to suggest measures to root out a problem rather than search for ways to subside it. Philip Noel-Baker, the British representative to the United Nations Security Council, had once stated that ‘Gandhi was the friend of the poorest and the loneliest and the lost’. He had also predicted that Gandhiji’s ‘greatest achievements are still to come’. 4.On the sad demise of Gandhiji, Pandit Jawaharlal Nehru had rightly said and I quote: "The light is gone and yet it will shine for a thousand years” (unquote). Since then, the world has witnessed sea-change in social, political and economic landscapes. Yet, the importance of Gandhian thought of truth, morality and ethics remain integral to our national consciousness. Gandhian philosophy never turns obsolete, as even decades after his death world leaders continue to follow his ideals to achieve human development. 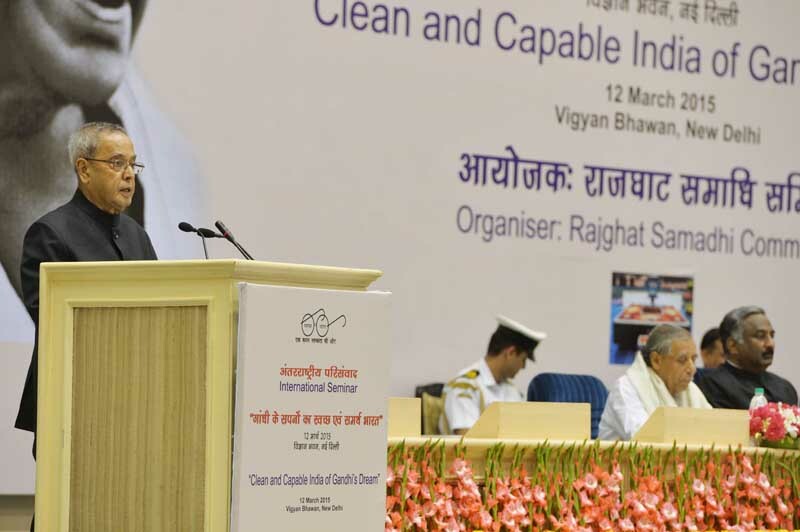 5.We have recently embarked upon two important initiatives: (i) Swachh Bharat Mission – to achieve a Clean India by 2nd October 2019, to coincide with the 150th Birth Anniversary of Gandhiji; and (ii)Make-in-Indiacampaign – aimed at enhancing the manufacturing capability of our nation. The noble aims ofSwachh andSamarth (or capable) Bharat comprised a significant part of the Gandhian discourse. I hope the discussions by scholars at this forum through the prism of Gandhiji’s vision would lead to greater public awareness of the long-drawn imperative to have a clean and capable India. 6.Gandhiji visualized cleanliness as having three dimensions - a clean mind, a clean body and clean surroundings. Holding that ‘cleanliness is next to godliness’, he had said and I quote: "We can no more gain God’s blessing with an unclean body than with an unclean mind. A clean body cannot reside in an unclean city” (unquote). 7.Taking a clue from what Gandhiji had asserted, the Swachh Bharat Missionenvisages the provision of sanitation facilities, including toilets, waste disposal systems and safe drinking water, to every family. A winning strategy to achieve a state of cleanliness, to my mind, would comprise engaging the citizenry, addressing the reduction of waste and improving the processing of waste. 8.Gandhiji highlighted the necessity of self-reliant villages to achieve equity and sustainability in economic growth. Firm in the belief that India lived in her villages he suggested a lifestyle structure comprising education, employment and health facilities that will encourage people to reside happily in rural areas. For him, reconstructing villages was the foremost step in rebuilding the nation and in achieving self-sufficiency and social equality. He espoused the spirit ofSamarth or capability for India to achieve economic self-reliance at large. 9.The Make-in-India campaign envisages turning Gandhiji’s dream of a self-sufficient and productive India into a reality. It aims at India becoming ‘Samarth’ on all fronts of economic development by facilitating investment, promoting innovation, fostering skill development and establishing best-in-class infrastructure. 10.The advantages of democracy, demography and demand are on India’s side. It is a push through a comprehensive strategy that is required to usher in a world-class manufacturing set-up in our country. Steps in this direction include: a facilitatory governance mechanism; building of smart cities and industrial clusters; development of specialized skills in the youth; and establishment of dedicated freight corridors for improved connectivity. More concretized action is necessary. Select domestic companies having leadership position in innovation and new technology should be identified to turn them into lead global businesses. Advanced and environmentally-sensitive manufacturing companies should be encouraged to make them an important part of the global value-chain. Overall, the ‘Make-in-India’ programme should lead to an attitudinal shift in how India relates to investors: not as a permit-issuing authority but as a true business partner. 11.A concerted effort to refurbish India will help realize Gandhiji’s dream of aSwachhandSamarth Bharat. The support and contribution of the wider section of society, including key stakeholders, is necessary. Gandhiji’s dream was guided by the light of knowledge and wisdom gained over centuries. Hence, a great responsibility is on the shoulders of those who understand his vision, to play a key role in this transformation. 12.I expect the deliberations in this seminar to cast new light on the depth and expanse of Gandhiji’s vision, and the ways in which it can become the guiding path for our effort. Gandhiji’s dream is our dream; his vision must lead us through the challenges of the present towards a clean, green and self-sufficient Bharat. 13.With these words, I conclude. I once again applaud the Rajghat Samadhi Committee for convening this important seminar. I also wish them the very best for all its future pursuits.